Tigers centre Mahe Fonua in action against the Sharks. 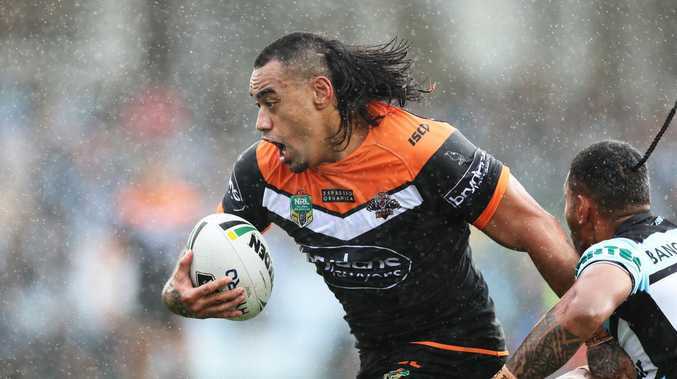 CULT hero Mahe Fonua has revealed a flat phone battery was the reason he turned up late to training last month, which resulted in his suspension by the club. "My alarm didn't go off on my old phone because it dies and I didn't put it on the charger that night," Fonua told The Sydney Morning Herald. "I've got a new phone now." Whatever the reason, coach Ivan Cleary wasted no time in suspending Fonua in order to keep the team's high standards and set an example of expectations. Fonua was coming off a man-of-the-match performance, but it was not enough to save him from being axed for the clash against Penrith on May 17, in a clear sign the Tigers run a tight ship under Cleary. "It was a wake-up call," Fonua said. "I didn't miss the actual training. I came in and missed some video. "I still took the field and trained but with the culture here and the direction we're heading I knew straight away we wouldn't let this slide. We don't want these things creeping in. "The last thing I wanted to do was go back to reserve grade and kick stones. I tried to put in my best performance and do what I could do to get rewarded with another call-up."